Yesterday morning I woke up at 6:45 to feed Kip. I picked up my phone, and there was a message from 15 minutes earlier. It was from my mom. Which is incredibly odd, since I often try to call her around 10:30 and she still hasn’t turned her phone back on from the previous night. So the fact that both her phone was on, and she had left me a message was nearly incomprehensible. She messaged me that Heidi and Genna, my nieces, were going to be passing through on their way to the airport, but were stopping for breakfast, and would I like to come join them? Finally. FINALLY!!! We made it out to the van and were on our way. As I was driving down the road, I began to think about why that morning had created such a respons from me, why it had made me feel so crazy. They are just little kids and it should be expected and I really didn’t need to be feeling so frayed or coming unravelled. They were just shoes. And jackets. And I know what herding cats feels like and it shouldn’t feel this chaotic. As I drove and thought, I thought of a hurricane. Absolute bedlam and turmoil happens with a hirricane, but at the very center there is peace. The eye of the storm is calm and peaceful, ignoring the absolute pandemonium that is literally all around it. And so, I began to say to myself, “I am the eye of the storm. I am strong. I am stronger than the storm. I am calm. Whatever is happening outside of me does not affect what is happening inside of me. It does not disrupt my tranquility. The storm may rage, or it may go away altogether, but that does not change my inner peace, my inner strength...” I recited something along the lines of that, and several variations on that theme. And then I listened to my scriptures as I drove, so that by the time I reached my parent’s house, I was once again at peace. That little mantra that I started saying to myself yesterday sure came in handy today, though! Vince took upon himself the role of Angel of Destruction. Every time I turned around he had done something new. The day started out so promising, too! It was a gloriously cold and cloudy morning. The kind that puts fog and frost on the windows, and the blankets were so warm and snuggly! It was really hard to leave my little cocoon of toasty softness. After cuddling with the littles and watching some of my favorite cartoons with them (Tiny Toons, y’all! ), we finally decided to get up and embrace the drizzly day. I was going to get some mad skills cleaning done! Except Kip needed to eat. While I was feeding the baby, Vince dumped out a box of cereal. I scolded him and switched Kip to the other side. And Vince found another box of cereal and dumped that one out, too! Once I got the baby to sleep I went into the kitchen to start cleaning and discovered half a bottle of juice had been dumped all over the stove, and floor. I cleaned that up and then started lunch. Leftovers! 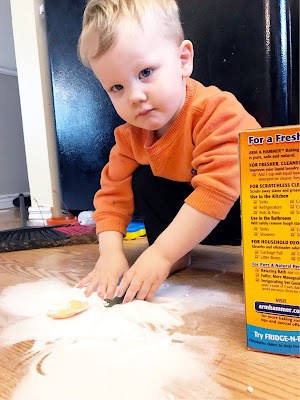 As I was heating up the spaghetti sauce and cooking some new noodles, quick as a flash, Vince grabbed a half full 4 lb box of baking soda off the counter and dumped it all out. I am convinced that my new mantra was heaven sent, and is the only reason both my 1 year old, and I survived the day today.